“He’s all about this smelly, watery stuff. I’ve been meaning to ask you about it. It’s banned in the UK or something.” That’s a text I received back in February from one of my dearest friends, regarding her skincare loving husband’s latest craze. Not willing to live the rest of my life without knowing what the name of this smelly, watery product was, I did a little prodding. It turns out her husband’s latest skincare obsession was the cult classic, Biologique Recherche Lotion P50 1970 original formula, a high-end, spa-exclusive, exfoliating acid toner with an avid following and a “burn” that is cherished by those who use it. 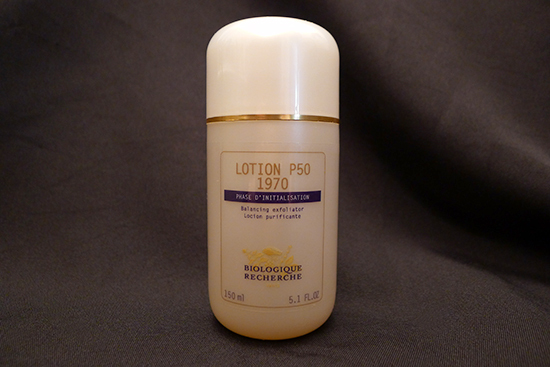 The original Lotion P50 is a flagship product for the French company, Biologique Recherche. The “burn” is a sensation produced by the inclusion of an ingredient called phenol. I’ll talk more about phenol in just a bit, but right now the relevant thing is that its use has been banned in the European Union. As a result, the original formula is no longer sold anywhere in Europe, though it is still available in select US spas under the name Lotion P50 1970 Formula. The slight name change was made to distinguish it from the newer, phenol-free formula, Lotion P50, which is sold in exclusive spas worldwide. There was only one logical course of action I could take after this conversation with my friend: buy a whole bunch of P50 and put it on my face. 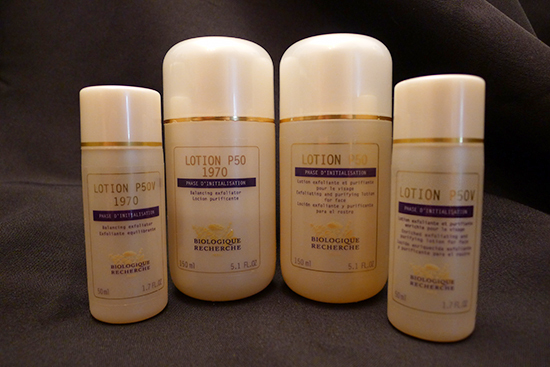 Biologique Recherche Lotion P50 1970 (original formula) and Lotion P50 (new formula) are both exfoliating acid toners. These products are designed to strengthen the epidermal shield, exfoliate skin, regulate excessive sebum secretion, hydrate skin, maintain the skin’s pH, as well as prevent and treat ingrown hairs. The Lotion P50 range actually consists of 6 different product options. There is the Lotion P50, which is the full strength version, Lotion P50V, a medium strength version, and Lotion P50W, a mild version for mature, drier skin types. All 3 strengths are available in both the original formula and the newer, phenol-free formula. Lotion P50 isn’t as easy to come by as many skincare products. Only a few exclusive spas actually carry the Biologique Recherche line to begin with, and of those spas, even fewer actually sell it online. Those that do sell it online require customers to create and log in to an account before the prices are revealed. All of them strongly recommend consulting with a spa specialist (either over the phone or online) before purchasing, to ensure you’re getting the appropriate Lotion P50 for your individual skin type. I actually consulted with 3 different spas. I consulted via email for 2 of them, and the other over the phone. I provided information about my skin type, skin concerns, and my history of acid use (not the psychedelic kind). Two of the 3 spas recommended the full-strength Lotion P50 1970 for me, and the other recommended the medium strength Lotion P50V 1970. I bought both the new and original formulas for both strengths, but the full strength versions are the focus of this review. Water (Aqua), Glycerin, Phenol, Niacinamide, Vinegar (Acetum), Ethoxydiglycol, Magnesium Chloride, Lactic Acid, Arctium Lappa Root (Burdock Root) Extract, Salicylic Acid, Sodium Benzoate, Sulfur. If you are over the age of 40, or if you’ve ever watched a medical drama set in the past (I recommend “London Hospital” if you’re into that sort of thing), you might remember the use of carbolic soap as an antiseptic cleanser, which was popular in clinical settings from the early 1900s until the 1970s. The antiseptic ingredient in carbolic soap is a volatile, slightly acidic component called carbolic acid, which is another name for phenol. In addition to being antiseptic, phenol is also a mild anesthetic. It has been shown to posses skin-lightening properties as well. Its role in the P50 formula is primarily antiseptic, but I would venture to guess that the burn (and subsequent numbing) it imparts when it comes in contact with the skin also played a strategic part in its inclusion. Lotion P50 fanatics love the burn. If you live in the US, you’ve probably encountered phenol before. It’s the active numbing ingredient in the throat spray, Chloraspetic (and the ingredient responsible for that spray’s distinctive smell), one of the active ingredients in Carmex lip balm, as well as a component of the ubiquitous mouthwash, Listerine (listed on the label as “Thymol,” which is actually a phenol compound). Though it’s clearly allowed in personal care formulas in the US, its use has been banned for years in the EU due to safety concerns. Though you won’t melt or keel over if exposed to the amounts found in personal care products, it’s a well-established corrosive, toxic if inhaled or swallowed, and capable of damaging or burning skin in concentrations greater than 1.5%. Additionally, even prolonged exposure to lower concentrations have a propensity to cause contact dermatitis – this is largely why carbolic soap is no longer seen in clinical settings. I despise fearmongering, and I hate that skincare is one of the most common targets of such a slimy phenomenon. However, phenol is sketchy. No, your face won’t fall off – mine didn’t – and you won’t die of kidney failure from using a personal care product that contains phenol; not even if you drink an entire bottle of Listerine. But there is a high irritation risk with its usage, even in small amounts, and I’ve personally come to the conclusion that the risks outweigh the benefits of using a phenol product long term. Lactic acid is my favorite alpha hydroxy acid. It is the gentlest of the alpha hydroxy acids, due mostly to its large molecule size, which prevents it from penetrating the skin too deeply and causing irritation. However, there is some clinical evidence that lactic acid, though less irritating, is also more effective than glycolic acid for stimulating cell turnover. Additionally, it brings some skincare benefits to the table the glycolic acid doesn’t – lactic acid helps strengthen the skin’s protective barrier by increasing the production of natural ceramides in the skin. Lactic acid is also more hydrating than glycolic, and like glycolic, it also has hyperpigmentation lightening properties. Salicylic acid is a beta hydroxy acid (BHA) that is often used as an acne treatment. It is a naturally occurring ingredient, usually derived from willow bark, but also occurs in other sources. Salicylic acid has been shown in multiple studies to improve skin barrier function and collagen production. It’s best used in concentrations from 0.5% – 2%. The reason BHA is such an effective treatment is because not only is it antimicrobial, anti-inflammatory, and exfoliating – it also has the ability to travel deeper into the skin than many other skincare actives, including AHAs. Clinical evidence on the efficacy and safety of an antioxidant optimized 1.5% salicylic acid (SA) cream in the treatment of facial acne: an open, baseline-controlled clinical study. Treatment of acne vulgaris with salicylic acid pads. Sulfur: it stinks, but it’s a fairly effective treatment for acne due to its antibacterial and exfoliating properties. Thankfully, any trace of the smell in this product has been completely eclipsed by the phenol. According to CosDNA, sulfur scores between 0 and 2 as a potential irritant. Phenol is listed as a level 2 hazard, and salicylic acid is listed s level 1 hazard. Malic acid is an apple-derived alpha hydroxy acid (AHA). It increases cell turnover, and is an effective lightener for hyperpigmentation. It’s often used in conjunction with Vitamin C to treat melasma. Phytic acid is a gentle AHA derived from fruit seeds and grains. Like other AHAs, Phytic acid promotes cell turnover, lightens uneven skin tone, and diminishes fine lines. Thyme oil is an essential oil that is often used in acne treatments for its antiseptic and bactericidal effects. One 2012 study actually showed it be a more effective antibacterial agent than benzoyl peroxide or alcohol. According to CosDNA, salicylic acid is a level 1 hazard, and sulfur scores between 0 and 2 as a potential irritant. The bottles for both Lotion P50 formulas are identical (except for labels, of course). Both of them are light pink, plastic bottles donning white plastic caps with a gold trim. The dispensers are the standard plastic-with-a-hole-in-it variety. 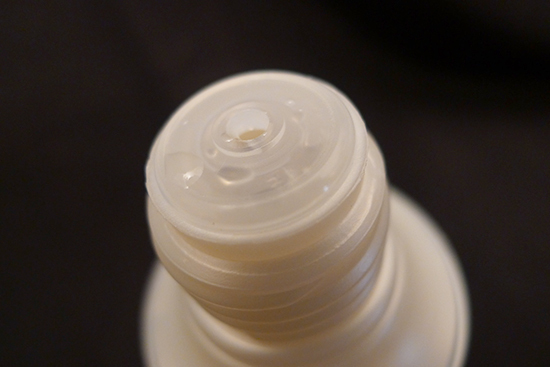 The Lotion P50 itself is clear, and the same consistency as water. pH is another area in which the newer Lotion P50 formula is superior to the original 1970 formula. 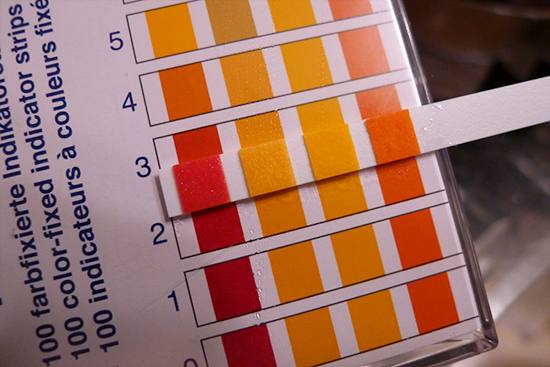 AHAs are optimally effective within a pH range between 3.0 and 4.0. The pH for Lotion P50 1970 is 3.5, while the pH for the new Lotion P50 formula is 3.0. 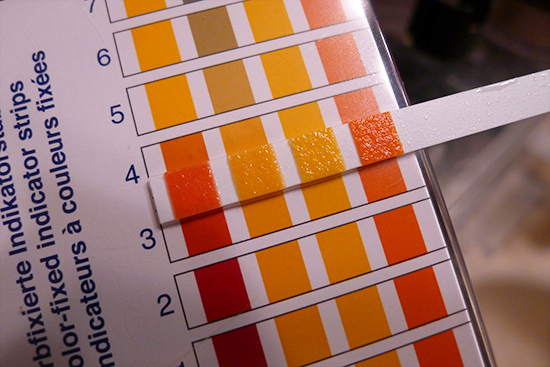 Both pH levels are effective, but AHA results increase in both speed and efficacy at the lower end of that 3-4 scale. The pH for the original Lotion P50 1970 formula is 3.5. The pH for the new formula Lotion P50 is 3.0. The original Lotion P50 1970 formula smells exactly, and I mean exactly like Chloroseptic. The smell is very strong and very medicinal. I actually grew to like it over time, but there are many people – even fans of this product – who very vocally hate the way this product smells. The smell only lingers for about 5 minutes on my face, but my bathroom smells like Chloraseptic for hours after I’ve used this toner. The newer P50 formula just kind of smells like your standard, run-of-the-mill acid product. It’s medicinally plain with base notes of nail polish remover. The smell dissipates almost immediately after application. Normally I turn my nose up at any set of product instructions that tell me to apply with a cotton pad. Not this one, though. This product needs cotton pads. With both formulas, I pour a bit of P50 on a cotton pad and smooth it over my face and neck immediately after cleansing. If I’m applying a BHA and/or any other pH-dependent acid products, I’ll apply them immediately after the P50. Then I wait between 10 and 20 minutes before finishing the rest of my skincare routine. When I apply the Lotion P50 1970 formula, it burns. It’s supposed to burn. People love the burn. The first time I used it, I had an idea of what I was in for and it still surprised me a little. It wasn’t unbearable, but it was intense. The burning sensation is a “cool burn,” and only lasts in its purest form for about 15 seconds before melting into an overall facial numbness from the phenol’s anesthetic properties. The numbness lasts anywhere from 5 to 10 minutes. If I’m putting skincare products on immediately afterward, the sensation is really interesting. By the third day or so, I totally understood why people are so into the physical sensation of this product. Unfortunately, the original 1970 formula made my face turn beet red. Between the redness, the burning, and the numbness, it was hard not to be preoccupied with how irritated I knew my skin was. The new formula Lotion P50 doesn’t burn at all, though it does have that familiar, low-powered electric fence, acid tingle. It doesn’t last as long as the burn does, or even as long as some of my stronger AHA products such as the Paula’s Choice treatment I reviewed earlier this week. My face does not change color when I use the newer P50 formula. 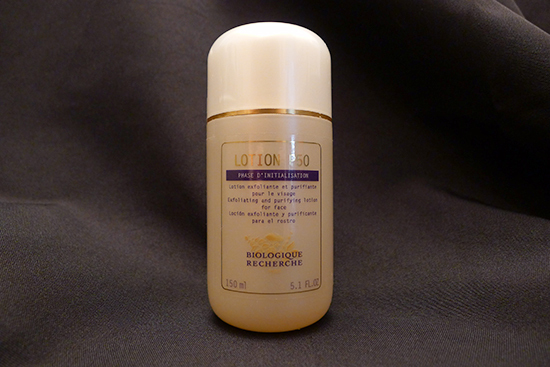 I used the Biologique Recherche Lotion P50 1970 for about 4 weeks. In that time, my skin’s texture visibly improved quite a bit, and though my pores aren’t very large to begin with, they began to appear smaller after just the first 3 days of use. The texture change was especially apparent on and around my nose, which is where my pores appear largest. I also experienced some overall brightening, which leveled out around week 2 and sustained throughout the products usage. The brightening effect wasn’t as dramatic as what I experienced with the 10% AHA Paula’s Choice treatment, but it was visibly noticeable. There were some downsides to the 1970 formula for me. For one thing, I know my skin was irritated immediately after application – the redness made that very apparent. But I also found that my skin was drier than usual, a trend that was consistent throughout my usage of this particular formula. I did not experience any breakouts as a result of using this toner. Just before hitting the 4 week mark on the 1970 formula, I switched to the newer, phenol-free formula. The second I felt that acid tingle I knew something special was about to happen. 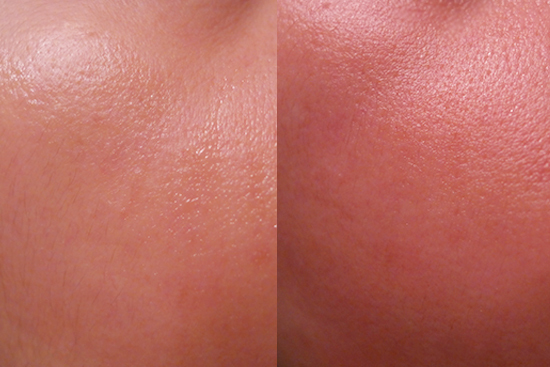 I am now 6 weeks into the new formula Lotion P50. My pore size stayed small, my complexion stayed bright, but because I wasn’t experiencing the drying effects of the 1970 formula, my face was actually able to reach a state of glowiness that was just out of reach with the original formula. By week 2, Biologique Recherche Lotion P50 was my new Holy Grail toner. I’ll be updating my skincare routine to reflect this change soon, but let me tell you right now: I understand why this toner’s status is so legendary. I actually attempted to try the Pixi Glow Tonic Beauty Elixr last week, which is a glycolic acid toner that is often touted as a P50 “dupe.” I gave up after 4 days. I actually noticed a subtle decrease in the quality of my skin texture by day 4, and I was missing the tingle. Then I tested the pH for the Pixi Glow and saw that it was a 4.0, and I decided I wasn’t in the mood to be disappointed. I texted my friend a couple of weeks ago with a message for her P50 1970-loving husband. I said the ingredients in the new formula were better, that the pH was more effective, that it was just a better product in general. “The burn is overrated!” I said. There are 3 spas that I know of in the US that carry the Biologique Recherche product line. Before ordering from any of them, I highly recommend talking to a product specialist at the place you're ordering from so they can determine which formula is right for your skin. I've order Biologique Recherche from both Rescue Spa and Vicki Morav, and shipping was ridiculously fast from both places. They also both included an obscene amount of Biologique Recherche samples with each order. Toska Spa carries the original P50 1970 formula, but not the new formula. Girl! I can’t believe you put up with the burn for nearly month! Your skin looks angry in that photo you posted! Thanks for the review and kudos for the dedication to your skincare passion! It helps is all out. Ha! Thanks, KB. 🙂 Really, though, the burning/numbing sensation was oddly appealing. I think if it weren’t for the redness, I’d have stuck it out much longer! Hi Kerry, thanks so much for this post! so informative!I have been using the 1970 version and I had no idea there was a newer version. After your post, def using the new version. what is your daily skin care regimen? There are so many products out there which gets confusing. I am just now trying to come up with a regimen as I an only now understanding how important skin care is. … Can I asked how much of each product you used in about a month? I’m totally interested, but it would be great to know how long one of those bottles would last. Hi Gwen! There’s enough in the medium sized bottle (the $59 one) to last around 2 months with twice daily usage. I just recently splurged on the large bottle – there’s at least 4 months in that one and at $92, a better deal in terms of price per ounce. FYI, I put a few drops on my fingers and apply it directly to my face nightly. My bottle has lasted well over a year this way. Do you plan to replace the current Benton toner in your current skin care routine with the Biologique toner permanently given the results? I have one more bottle of glow tonic and I had really hoped you don’t like this one better. The price difference is so significant that I am arguing back and forth. I am sure curiosity will win out eventually. Thank you for the detailed review and the sourcing options. I had halfheartedly tried to find an online retailer but gave up quickly because it was just too cumbersome. Thank you! PS: my Walgreens/Duane Reade sticks pepta-bright. Any chance you are reviewing that in the future? I haven’t heard of Pepta-bright before! I’ll have to look that one up. Is it an acid toner too? This is a great comprehensive review! Especially for someone, like me, who hasn’t heard of this before. Thanks for including so much about Phenol! Thanks Arielle! It’s my pleasure! With every review you post I love your blog even more. They’re informative without leaving me feeling lost. Would you be willing to share what your routine looks like currently? I buy things and then I’m never sure if I should use them together, what order, etc. My routine is always changing since I’m constantly testing new products. At the moment, I’m trying out a few Hadalabo products, a couple of Su:m37 items, and a couple of Caudalie products. In terms of product order, thinnest to thickest is my general rule, but I make exceptions for products that are pH dependent, such as AHA or BHA treatments. I do plan on writing a post soon about building a skin care routine, which will include some information about what ingredients should and shouldn’t be used together. I’ll also be updating my baseline skin care routine in a couple of weeks, which are the products I go back to when my skin needs a break. Thank you for answering! I’m excited to see your post on how to build a skincare routine. My skin has been going through a lot of changes lately and I’ve found myself trying to “fix” things I had never worried before like PIH, sensibility to some products and hormonal breakouts. I haven’t tried any Caudalie toners yet. What’s the name of the one you have sitting in your medicine cabinet? Hi Kerry, very informative as always. So is this more of a preventive toner for pigment prone skin? Ok. I am battling some serious hyperpigmentation patches …so my current skincare routine is fixing that problem. So i guess this toner is more suited in maintaining my skin tone after I have cleared all my hyperpigmentation right? Yes, I second more post on sunscreen. Also, body care :-). Yes, it would help maintain your skin tone. I think it would help your other hyperpigmentationproducts do their work more effectively too, since the daily exfoliation would improve product penetration. Okay, definitely ordering one now, love that it has lactic acid and Niacinamide. Here’s to getting my clear skin back :-). Kerry, order it and it has already been shipped. Merci. Thank you for the review Kerry! Can’t wait to try this. Charlotte-I’m battling with sunspots and hyper pigmentation also. Do you mind if I ask what is your skincare routine like and what products are you using? Thanks! Hi Ami, Sorry for my late response, for some reason i didn’t get comments updates. I don’t mind and would love to help. Okay, just a background I have oily, acne prone skin and comedones, so I try and look for clarifying and purifying products. What skin type do you have? Based on my research I would have liked to add Missha Super Aqua Cell Renew Snail cream and sleeping pack to boost my routine, but I am nursing and still researching on the effect of snail secretions. But you should research these products. Let me know, if you wanna know the products I use for weekly treatment…yep still have more products than these :-). Also, I have a routine, I plan to use once my hyperpigmentation is gone. Charlotte, thank you so much for sharing your routine and products! I have combination, acne prone, blackhead, and sensitive skin. I didn’t have acne in my teenager years, it just start several years ago and continue to now in my late 20s. My skin doesn’t seem to like a lot if products so it’s difficult to find one that i can continue to use. I had try shiseido line but that broke me out so bad. I tried the tatcha line also and i love the rice enzyme powder but that seem to give me subclinical acne. Your regular skin routine is very good. I would just suggest you add, SPF 50 sunscreen, use the vitamin C serum as this really prevents discoloration and guards against free radicals. And at night a serum that has rentinol or Niacinamide (this stuff is like botox). For the weekly treatments: you basically do the same thing as I do in my normal skincare, clay mask ( I stream my face while the mask is on) , peel gels, and massage. I also use Dr/ Jart pore purifying sheet mask and skinmisso mask pack as I have really bad comedones in my nose and chin. Could you send me your mask recipe, I am really interested in trying that out. Once your sunspots/pigmentation has faded sufficiently for you, then you go back to your regular skin routine but add a serum with active arbutin (not more than 4%) at night, this will even out your skin tone in 2-3 months. I really like Rohto hada arbutin whitening Serum. I know I use alot of products :-), but this is not my normal skincare routine, I am using this routine for now cos I am battling hyperpigmentation (was 8 shades darker than my skin tone) and dull skin as well as my usual bad acne, blackheads and comedones. I totally understand what you mean by running late. You know you can try Nature Republic – UV Lock Ultra Spray Sun SPF 50 (got it from W2 beauty) for days you are running late. It’s so easy to spray this in the morning, just before you leave home. Now, I have to add the 5 layer sheet to my list :-), will definitely try it this week, I am looking to clear pores. I will let you know how it goes. Yes, it is paper and ships from China. But that is a good point it should be 100% cotton. I saw some on w2 beauty will ask alice about it and will also view the link to the Muji ones. Hahaha..totally get you on the shipping, I subscribed for amazon prime. Hi Ami, How is your hyper-pigmentation, is it getting better? Hi charlotte! How are you? How’s your skin now? After i follow Kerry’s update routine my skin got better but it just relapse last week lol i think i ate too many cream cheese wonton or i’m sensitive to the new shampoo i just bought. I have very tiny itchy dots on my face and around the eye corner too. Also pimple around the mouth area :/ so right now i have gone cold turkey on all products except the really basic benton line. My hyperpigment seem to stop it didnt get worse but not better. I want to try the peter thomas product you recommend but i just got the paula choice weekly treatment so ill wait and see. Do you have any HG product right now? It so sad that p50 doesnt agree with me, i have two sample bottle that i havent gone bk to try. I’m a new subscriber, but have really been loving your blog! I’m currently using Skinceuticals LHA Solution — which has glycolic, LHA, and salicylic acids — as my exfoliating toner, but I’m curious to try this out after I’ve used that up, because it sounds really good. Hi Emy! I haven’t tried the Skinceuticals LHA before, but it sounds like something I’d be into. How do you like it? I had to check out the LHA solution on the Skinceuticals site after you mentioned it earlier. They recommend using it as a toner twice a day – it wouldn’t hurt to try! That phenol stuff does not sound good, yikes! I’ve heard quite a lot about this product, so your review is very helpful indeed…but it seems like even in its new formulation, it might be too much for my skin. I’ve really backed off most acids for a while, as I think I overdid it and damaged my skin’s moisture barrier. I’m guessing you take a break from the PC BHA/AHA products while using this, correct? Thanks as always for your excellent reviews! Hey Alissa! I can totally sympathize about the damaged moisture barrier. 🙁 That used to happen to me somewhat freqently, especially when I first started using Tretinoin. My skin is much more tolerant of acids these days, thankfully. If you want to try the P50 after you’ve given your moisture barrier some time to repair itself, you could always start with one of the lower strength Lotion P50 formulas – the P50V or even the P50W. It might even be that the P50V or W is more ideal for skin type in general. Rescue Spa and Vicki Morav both sell travel sizes of all the P50 products. The price per ounce is a lot higher for those, but the investment is lower – $25 per bottle instead of $59 or $92. That way if f you decide to try one of them out and it’s still much for your skin, you’re only $25 in the hole. I actually use the P50 with the PC BHA (daily) and the PC AHA treatment (weekly). I haven’t had any issues yet! Phenol is the active ingredient in deep chemical peels, the ones that give dramatic results b/c they cause a second-degree burn. Do you know if it’s outlawed completely in the EU, or just for personal products? Of course the peels have a higher percentage of phenol. I wonder what the percentage is for the lotion since it’s high up on the ingredients list. Are you giving yourself a mini-peel when you use it since it burns? Hi Victoria! That’s an excellent question. I’m not sure if it’s outlawed in clinical settings. I know that its banned in personal care and household cleaning products, but beyond that, I’m don’t know. I’m not sure what the phenol percentage is in the P50, but I imagine it’s fairly low, even though it’s near the front of the ingredient list. 1 – 1.5% (depending on your source) is the concentration threshold before skin damage occurs. Clinical phenol peels are much more concentrated (~16-50%) and mixed with other solutions to help it penetrate – usually some kind of water and croton oil mixture. Because the concentration is so low in the P50, and the formula is so different from that of a chemical peel, I don’t think it’s like a miniature phenol peel. I’m so glad I read your review of P50. I’ve seen it mentioned loads of times on Caroline Hiron’s blog, but I could never tell the difference between the formulas and what they did. Now I really want to try it. Your analysis is extremely helpful! I found Caroline’s blog in the process of researching this product a couple of months ago, and suddenly felt like I’d been living under a rock for not knowing about it sooner! I absolutely love her blog, as well as her recent YouTube videos. I appreciate a skin care guru that loves luxury. I’m so glad my analysis helped. Do you think you’ll be trying it anytime soon? Yes, I’m so glad she’s on YouTube now! I bought the Pixi Glow Tonic after reading about it on her blog, so once I finish that I think I’ll try the P50. Now I kinda wish that Pixi bottle wasn’t so huge. Great review once again! I’m now tempted to buy this but dang it’s expensive. I have the pixi glow tonic but it made me break out so bad! That’s a bummer about the Pixi Glow Tonic, Natasha. 🙁 I wonder which ingredient it is that your skin doesn’t like. Are you acne prone in general? I experienced the same w/ pixi glow tonic and also i couldnt stand the smell. It smelled like overly perfumy and flowery, something my grandma would wear and the smell lingered. I stopped using it just bc of that. Starting with the lowest strength sounds smart! Also, Rescue Spa and Vicki Morav both sell travel sizes of all the P50 products. The price per ounce is a lot higher for those, but the investment is lower. It’s nice because if you try it out and it’s still much for your skin, you’re only out $25 instead of $59 or $92. Wonderful, informative review – great as usual, Kerry. I noticed that these two have lactic acid AND niacinamide in them, which I find unusual… I always read that BHAs/AHAs and niacinamide would interact if applied on skin together and cause an unslightly ‘niacin flush’. Do you have any info/opinion on this? Niacinamide protonates to nicotinic acid in low pH environments, as far as I know, so seeing it in something that’s such a low pH is interesting. Did you find out anything else regarding this? Also, the conversion of niacinamide to nicotinic acid is related to time, so as the pH lowers the reaction occurs faster. Maybe some bottles are older and contain a higher amount of nicotinic acid, while the others haven’t sat for that long. As a biologist in training, I shudder at the idea of putting phenol on my skin. It’s commonly used in the lab as an organic solvent, and it’s VERY powerful/dangerous. One of my faculty mentors was very nearly blinded in a phenol accident (his glasses saved his eyes, but his face was a mess for a while). Obviously the carbolic acid/hand soap kind is far less concentrated, but still. If I was going to get one of these, I’d get the new formula. Oh my goodness! I’m so glad your coworker wasn’t blinded. That’s so scary! Thanks for sharing, Betsy. It’s great to hear some input from someone who has worked around the chemical. I’d add that in addition to omitting phenol, the newer P50 truly is a better formulated product, and therefore a smarter buy. Just a FYI. You can also get the P50 and other Biologique Recherche products from Aida Bicaj spa. She is based in New York City in Manhattan. The web address is below. I’m so happy to have discovered this amazing blog! What a great review. I’m going to France next month and was wondering if the line is readily available from pharmacies or is it also only available from spas? Thanks. I believe there is also a Guerlain boutique a few blocks away. You could make an afternoon of it! Hi kerry! First time post but I’ve been following your blog for a while now. I emailed the shop rescue spa for more info on this product along with my current skin care and skin condition. Kim (the person who emailed me back) recommended me to use the Iribiol serum and Masque Vivant in conjunction since I’m looking to reduce my usage of 2.5% Benzoyl peroxide for my mild acne. I was just wondering if you had also tried those products as well. A little part of me feels like its a hook to spend more money than needed… But the products seem interesting. Hi Lily! I have tried both of those products. The Iribiol serum is just okay. It’s a salicylic acid serum with a little zinc in it. I’m not sure what the BHA % is for it, but the results I saw with it weren’t as good as what I experience from my Paula’s Choice 2% BHA. Iribiol also contains SD alcohol as an ingredient, so that’s something to consider if that’s a concern for you. I really like Masque Vivant. It has some nice moisturizing and calming benefits. It’s a fermented yeast mask and it doesn’t have any added fragrance, so it smells really strongly of Marmite. I personally like the smell (it kind of makes me hungry), but a lot of people find it overpowering and weird. If you were going to add any additional Biologique Recherche products to your order, I would definitely recommend the Lait U cleanser. I contacted 2 of the spas. I told them that I have acne prone, combination oil at the T zone, and sensitive skin. They both recommend that I try P50W 1970 and slowly increase to P50V 1970. But after what happened to you I really don’t want my face to get all red and burn like yours! Do you think I should try P50W of the new formula instead? P.S I just read your morning routine update. You look gorgeous! I’m so jealous of your skin lol. Thank you for all the information! Hi Ami! Yes, I would personally try the new formula P50W instead. I have a strong preference for the phenol-free version because it has a better ingredient list, the pH is a little lower (making the acids more effective), it’s less drying, and less likely to cause irritation. That said, a lot of people really love the original version with phenol – I imagine it gets recommended a lot because it has such a cult following. Maybe you could try a travel size bottle of each and see which formula you prefer? They don’t offer the P50W 1970 in travel size 🙁 so I just order Lotion P50V 1970 and the new Biologique Recherche Lotion P50W from Vicki Morav since they have free shipping compare to Rescue Spa. Can’t wait to try these! Hey Kerry! so here’s my update on the P50. The P50V 1970 was back ordered so I changed it to P50 1970 and P50W. For the first 2 days I used the 1970 and my face did turn bright red, but it toned down right away when I put on my Vit C and BHA. I didn’t really like the smell, my husband said I smelled like rubber whenever I used it lol. So I switched to the new formula and been using it twice daily, at the same time with PC BHA. For some reason if I use Vit C serum in the morning it will give me blackhead so I switched it and only use it for night time. I’m on my 7th day now and it really make my skin glow and shrink my pore size. oh I forgot to mention that I did got a purge phase with P50! Huge red angry closed comedones on my Tzone :/ I didn’t get flaking until the 7th days. I had assume that since I been using PC and tretinoin for a while, my skin will be ok but apparent not lol. So i’m planning to cut back on all the acids. I’ll be using the P50 once every other day and PC once a day. But overall I really like the new formula and will be repurchasing it, even though it smell like vinegar! So here’s my two cents, Beware, anyone out there who’s looking into trying P50, take it really slow and ease into it 😀 Use lot of moisturizer too! The ‘burn’ from the original formula doesn’t seem to bother me much. It wasn’t as intense as i had anticipate :)The new formula gives me an itchy tingling sensation for about a min or two. Since the new formula has better ingredient, i’ll be buying that once i use up the travel size. What surprise me is that with four HUGE pimples from purging my face is so smooth and bright! Hi Ami! I’m so glad you like the P50! But although it is possible that you’re purging since this is an acid active, I’m curious about your breakout. Usually purging doesn’t manifest as “huge” pimples, so I’m worried that you may be having a reaction to the product. Are the spots in areas where you would normally break out? Are they cystic pimples or do they look more like whiteheads? Kerry, i really hope it’s just purging! I’m going to let my skin clear up and slowly start over. I had only use the 1970 for two days and nothing happened. The pimples show up after i switch to the new one. Cross fingers! Hi Ellie! I don’t normally like cotton pads either. The reason I don’t like using my hands for this toner is that it’s both very watery and very strong. The watery consistency makes it very difficult to get even distribution with my fingers, and when the product builds up in specific areas of the face, it can cause irritation from the higher concentration of acids in those spots. A cotton pad gives me more even distribution. Also, I would suggest round, flat cotton pads over cotton balls. The flat pads use less product. Kerry, they are the same spot where i’m normal break out. They are cystic i believe. They’re more red and bigger compare to my normal ones. Keep a close eye on that breakout then, Ami! 🙂 Usually a purging breakout manifests as smaller whiteheads as opposed to cystic pimples. Do you remember if you started seeing them after the P50 1970 or the new formula P50? If they don’t start going away soon, or if you start seeing more of them, take a break and see if they get better. I would be really bummed for you if you were having a product reaction and kept using it without realizing that’s what it was! Do you think the Lotion P50 could be sprayed on (if you found a spray top that fit the bottle, or decanted it) instead of applied with a cotton pad? That’s an excellent question, Amy! I’m really not sure. I would be worried about it getting in my eyes, but if I were to try it, I would definitely pat it with my fingertips after spraying to make sure all my skin was covered. If you decide to try it with a spray bottle, let me know how it goes. I’m curious! Hi Kerry ! First may I just start off by staying that your blog is absolutely brilliant. I have surfed the internet for quite a bit trying to find a comparative review of the two Lotion P50 formulas, and there I found your post along with the many others on this lovely blog. As a teenager who takes skincare very seriously it’s so wonderful seeing a blog devoted to it. : ) I actually had a question regarding the two different strengths of the toner you purchased. I have teenage skin and was wondering what your thoughts were on the lower strength formulas. My skin isn’t overly sensitive, but I am very sun senstive. I also don’t have acne ( thankfully ). Prevention for me is very important and from the looks of it Lotion P50 looks great for keeping spots at bay, and I’d like to keep my milia under control, so I was wondering what your thoughts were. Once again, your blog is so lovely, do keep writing. Could you please list the ingredients differences from the P50 (new formula) and the P50V (new formula)? I purchased the P50 (new formula) and have experienced redness around my nose and cheek areas. I figured maybe I should try a gentler formulation such as the P50V. Thank you for writing such an in-depth review, I was a little torn in between the new formulation without the phenol (because I’m paranoid about what it’ll do to my body in the long-term) so I was wondering if it produced as effective results. Now I’m really excited to get a bottle! I had to “join the discussion” because like I mentioned in other comments, I LOVE BR Lotion P50 New Formula! I have been using it for about a month now. It changed my skin in a matter of days. I stopped using it for a few days (I travelled without it…) and I could see the difference on my skin… I am now one of the many proud BR Lotion P50 followers! Hi Kerry, what an amazingly good article you have written. I’m sending it to my friends to read as it’s so comprehensive. Please, if you have time may I have the ingredient list of the P50V (not 1970) and then I can compare it to your P50 list above. Also do you happen to know the % of acids in both the new P50 and the P50V please? All the very best to you and thanks for this great post. I have been using the p50 1970 for a couple months and still have some hormonal breakouts. SO I deicded to buy Paula’s BHA from your morning routine and the snail serum. Will this be ok to use together with the p50 1970? New to your blog. so amazing. great information! Have you tried P50V? if so what were your thoughts? also I read your informative post about the mantle, is there a reason you prefer the Cerave Foaming over Cerave Hydrating cleanser? Thanks so much for this post. I’ve been using the P50 1970 for a year now and I always forget how great it is until I stop, even for a couple of days. I buy the small 1.7 oz. bottle from Rescue Spa for $20-something dollars and it lasts me 6+ months with morning-only usage (I use tretinoin at night) so for those of you concerned with the price, it ain’t cheap but a little goes a long way. Since the ingredients in the different formulations aren’t posted on the RS site, I didn’t realize how promising the newer phenol-free version is! It definitely seems like an upgrade with the addition of PHA and Malic (I have terribly discolored, sun damaged skin…), plus my skin gets red, too, like yours. I can’t wait to try the phenol-free version next time. Thanks again. I don’t live in US therefore personal consultation For BR lotion is not possible. I am asking a friend to buy me BR lotion p50 from US when she visits this month. My skin is slightly dry and dehydrated(cheeks). Not sensitive. My face feels tight even on just washing with water. I am guessing this is exactly your skin type. I am more concerned about having a “fair” and even complexion (being Asian :)) rather than reducing breakouts. Could you please suggest should I go for P50 or P50V. I’d go for the P50V! I recently switched to the P50V myself and have noticed I get the same results as I do with the full-strength P50, but it’s gentler. The rep at Vicki Morav also told me this time around that a lot of people with drier skin types like P50V better because it’s less likely to be drying (though I never noticed the full strength P50 drying me out). P50V on its way! Thanks a lot for the reply. This is such a thoroughly informative review. Thankyou! I know it’s been over a year since this post but I’m really hoping you’d answer a question about this product since your scientific approach to your reviews makes me believe you’d know or be able to find out. Most sites claim that the purpose of phenol is for antiseptic purposes but given that phenol peels are one of the strongest and deepest available for “in office” peels, could the phenol in P50’s 1970 formula have an exfoliating purpose? If it did, it would make sense as to why so many people feel the original is more effective. If phenols primary use is antiseptic then the older formula might be better for acne related issues but you’d think the newer formula would be much more effective for resurfacing given its higher AHA/BHA/PHA levels. On a side note, I’ve been informed by Biologique Recherche that the BHA content in P50 is 1%, so in your opinion would it be unnecessary to add additional BHA to a routine. I’m considering switching to the new formula because with its additional anti inflammatory & antioxidant ingredients added to the niacinimide & it’s famous ability to exfoliate, it would seem that it would be a powerhouse product in toner form with little need for other products other than sunscreen in the a.m. & Tretinoin in the p.m. (Like a toner and serum in one). But I’m still worried about giving up the phenol if it’s what makes it work. Lots to think about; I know… but would love to hear your thoughts. Hi there! I took your advice to get the biologique recherche – lotion p50 but I am wondering if this product is considered an AHA? Because don’t BHAs normally go before AHA? So would you use the Paula’s Choice BHA before or after the Biologique Recherche? Thank you for this amazing review, well, all your reviews are simply awesome. I have a question, I am currently using 10% AHA Paula’s Choice treatment and thinking to switch to this P50. Would you switch, or use them both? Wow! I really want to try it. Do you mind sharing who you consulted about which strength you should try? Please. I don’t want to have a consultation in person because I’d be too shy not to get a facial and I have no $$$ to do that lol. So I’d rather just email and call as well myself. Not sure where you’re based, but feel free to email me at info@lumierskin.com.au and I can help with a consultation. Although you can only but the product from me if you live in Australia, I’m happy to help with the formula that would best suit you! This article is fantastic, so happy I discovered your blog! A few questions I’m hoping you can help with – I’m now 30 and for the past 5 years have inexplicably suffered with adult acne. Around 2 weeks ago I introduced p50 with no phenol to my routine and am having breakouts around my chin and cheeks. I believe the overall appearance of my skin has improved but the breakouts are demotivating and really upsetting. Can you please let me know if the breakouts are normal and expected and I can expect them to subside or is the product simply not right for me? Please help!! I would truly appreciate your advice. Interestingly, I had the opposite reaction. I know this post is old, but I wanted to chime in, as I’ve used both versions of the product. I started using P50 in the original format some years ago, and loved it. I drifted away, looking for other products and came back when they reformulated without the phenol. I thought I’d give it another go. My skin hates the new formulation. I used it for about three months, telling myself the burn was just it working, but my skin was far more red than using the P50 1970. It burned more, and I never adapted to it the way I did with the 1970. I also hated the sticky, tacky feeling it left on my skin when it was done, and it never did seem to clear my acne the way the previous version did. I switched back to 1970 and my skin is much happier. It tingles a little, but doesn’t burn like the new version. I have no redness at all, and my skin feels soft, not sticky. I’m noticing marks fading faster, and I’m wondering if the niacinamide in this version has a higher concentration. I still don’t like the phenol, but there’s something about the old version that works far better for my skin than the newer, and worth trying for those who don’t like the texture of the new. Thank you so much for such a thorough review! I love the breakdown of the ingredients as it’s kind of hard to find even just a simple ingredient list for these and the fact that you tested the pH… you’re my hero! Wow, thanks for a thorough and scientific review! I completely agree- the new formula is amazing and turned my skin from a hormonal mess to a state where I don’t even need to wear foundation in less than a month. I will use for life. As a scientist (I have a PhD in biology) I would NEVER put phenol on my skin (I’ve even extra cautious about using it in the lab. It is pretty toxic!) and am frankly shocked that it hasn’t been banned. Hi, I just found out about this product. I’m using now retin-A at night and Drunken Elephant glycolic acid serum in the morning. Should I wait to finish the DE first and after the start the Biologique Recharche? Thank you for the thorough review. I love skincare as well, and I’ve tried a lot of it! I most recently purchased the new P50 and so far so good. Will you be reviewing the rest of BR line? I know there are a lot of different products, so I would never expect a review of each. As far as the brand goes, there aren’t any reviews of the other products in the line, only the P50 lotions. If you can share any feedback you’ve maybe even just heard, I would appreciate it. Thanks! I hope this post isn’t too old to get a reply. The 1970 version you listed all these wonderful things like the pores being gone and skin texture is great and all of that do you believe that the new version is just as good in all those aspects? Hi! Thank you for your review. I just bought mine today and was wondering how I can incorporate the P50 with my other actives. Do you know if it should be used before or after I an AHA or BHA? And by the way, can I even use another AHA? I read somewhere that you’re not supposed to use other AHA’s in combination with the P50. What do you think of that? Do you think I can still use my Cosrx AHA in my routine or wouldn’t you recommend it. Wish I’d read this article prior to purchase. This is the first space where I’ve actually been able to find a detailed list of the ingredients. My nose registers that chloroseptic smell as urine. I don’t know but the following day the waste paper basket or garbage always smells like a diaper genie that needs to be emptied. Will definitely try the Phenol free version next time.